With Imperial business limo service, you’ll finally get to say “No” to tardy arrivals to your corporate gatherings! Our budget-friendly rates will appeal to any critical business mind, yet our rich fleet can offer a solution for every businessman out there. You can rely on our limo service at all times, no matter if you are booking it for yourself or an important guest. Try our services just one and we promise we will become your favorite limo company to take you to your next meeting, conference or team-building exercise. Our carefully maintained luxury sedans, SUVs, and limos are equipped with the all the modern amenities and luxuries and they are all ready to impress your clients with an impeccable presentation. The Imperial Transportation team of dedicated professionals always tries to predict, meet, and when possible – exceed every passenger’s demand and desire. Every mile you travel with us will be an absolutely delightful experience. Business people know that they can count on us when they have roadshows and complicated itineraries and when they have to be at a certain conference or exhibit at certain times. Our chauffeur is always ready to take them to their next meeting and wait for them when they are ready to leave. You’ll have all the time in the world to catch up on your paperwork, check your emails or go through your presentation one more time before the meeting starts, while you enjoy the backseat of your limo rental. We will give you absolute privacy and a first-class experience that surpasses the one you would get on the plane. It is no wonder that most business people choose our service for their long-distance travels, too. 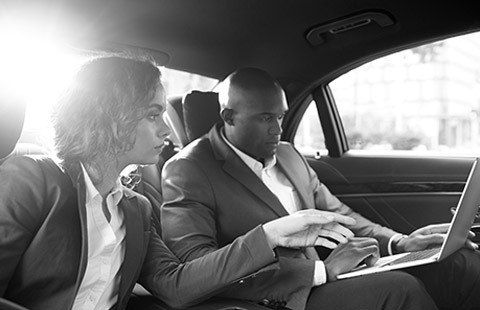 Our high-quality leather seats and the smooth driving of our chauffeurs will give you an unforgettable experience that will inspire you to book our corporate Orlando limo the next time you come to visit. One of our most requested services, especially when it comes to business transportation is Orlando airport limo service. Our business clients know they can count on us no matter if their plane is on time or delayed, no matter if they are arriving on the commercial airline or a private jet. We provide them and their clients with a superb service that includes everything from luggage assistance to complimentary water bottles. No matter which area of Davenport or Orlando you want to reach, our skilled chauffeurs will pick only the safest and quickest routes. You will be amazed when you see the level of expertise that they have when navigating busy Florida streets and highways, all for the sake of getting you swiftly & comfortably to your next business event. Don’t hesitate to reach out and let our amazing customer care associates know what specifics regarding your next ride shouldn’t be overlooked and they’ll go out of their way to arrange a ride of your dreams. With us, not a second of your precious time is wasted!